How school districts are organized in California is confusing. There are elementary districts, high school districts, or “unified” districts that span kindergarten through 12th grade. District boundaries do not line up with city/town boundaries. So, in Los Gatos many of our youngsters attend a school in Los Gatos Union School District (K-8) or Los Gatos Saratoga Joint Union High School District. But we also have a lot of residents whose homes fall within the borders of Loma Prieta Joint Union District, Union School District, and Campbell Union High School District. That’s why it was so nice to present a Commendation last night to Leigh High School. There are about 1700 students enrolled at Leigh and a third of them of are Los Gatos residents. The performing arts program at Leigh is outstanding, especially the marching band which one proud parent told me is the “winnigest” band in Santa Clara County. 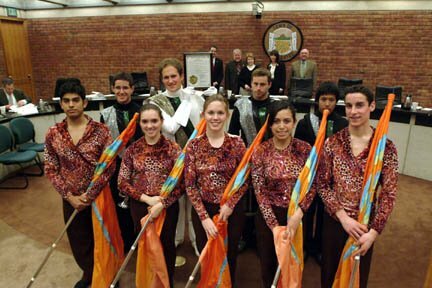 A few members came into Council Chambers to play the National Anthem and give us a glimpse of their award-winning style. It was a wonderful way to start a Council meeting, and I thank them for taking time to visit us. If you see them around town, please congratulate Drum Major: KENNY ENEBOE; Trumpet: JEFF WELLS; Snare Drum: DAN DEHAAN; Cymbals: KOSUKE OKAMURA; Color Guard: EMILY GRAY; Color Guard: ETHAN BROOKS, DEVIN HINZO, KATIE WOLLBRINCK, KARLA OSORIO, and Band Director CHRIS NALLS. Thank you mayor for the acknowledgment and kind words. It was such an honor last night to accept the award for our department and we really enjoyed being able to play for you and your council. The best thing about marching band is what it teaches all of the members, helping us to prepare for our future. Knowing that you, as the town of Los Gatos, recognized all of our hard work and dedication was truly an honor.